In 1960, Niger gained independence from France after a nation-wide referendum, and the country celebrated its 59th Independence Day on August 3rd, of this year. Freedom and self-governance weren’t the things being celebrated on August 3rd, however, as Niger also observes Arbor Day on the third of August. In 1975, the Nigerien government decided that Fête de l’Arbre would be celebrated on the same day as Independence Day to signify the importance of trees for Niger’s future and independent identity. The Nigerien government encourages every citizen of Niger to plant a tree on this day in the hope of staving off desertification, the degradation of fertile cropland and forests caused by droughts and deforestation. Aside from the founding of Arbor Day, there have been other practices put in place to encourage the planting and preservation of trees and greenery in Niger. The Farmer Managed Natural Regeneration (FMNR) is an approach created by Tony Rinaudo, an Australian agriculturist. Rinaudo has worked with local farmers to identify useful tree species and develop ways to prune and protect them. The goal of FMNR is to educate farmers to promote sustainable land restoration techniques that would ultimately increase tree growth and food production. In turn, this will help to alleviate hunger and poverty. FMNR has been a massive success in Niger. The land regeneration technique has been used on over 50 percent of Niger’s farmland, and the results can clearly be seen in aerial photographs and field surveys. One of the tree species that was identified as useful for land regeneration was the gao tree, which is now seen as “magical” by local Nigeriens. It has large roots that draw nitrogen from the air and fertilize the surrounding soil. Its leaves fall in the rainy season, which allows sunlight to shine through to the surrounding crops during a crucial time for their growth and development. Crops nourished by gao trees tend to hold water better and generate more produce. The trees also create a cooler microclimate and attract animals. Local Nigeriens can even crush the gao tree bark into powder for medicinal use. A program with the goal of fighting desertification on a grand scale is the Great Green Wall for the Sahara and Sahel Initiative (GGWSSI). The implementation of this project involves planting a “wall” of trees that spans over 20 countries, from Gambia in the west to Djibouti in the east (including Niger). This program was originally envisioned as a project that would restore the deteriorated landscape in the Sahara and Sahel regions while providing jobs for residents of the countries involved. If the program succeeds, both food security and resilience to climate change would be increased for the participating regions. 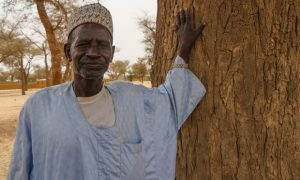 Because Niger has shown its land regeneration technique to be such a success, GGWSSI has now redirected its focus to sustainable land and water management, rather than strictly forestry. Since the launch of GGWSSI in 2007, it has evolved into an effort to surround the entire Sahara region with a belt of trees. Along with other tree planting programs around the world, FMNR and GGWSSI are demonstrating results in their attempt to “greenify” our earth once again, and Niger is playing an instrumental role in this endeavor. In addition to bringing wells into villages that provide easy access to water for gardening, Wells Bring Hope strives to play a part in sustainable skills education by teaching locals drip farming techniques and ways to use gray water for watering plants. Through hard work and perseverance, we may be able to provide a better environment for our future generations.